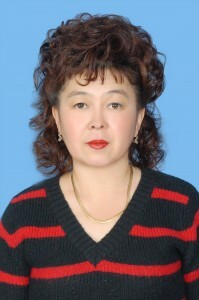 Bikesh Revovna Ospanova, born in 1960, Kazakh, higher education, in 1984 she graduated from Karaganda State University named after EABuketov with a degree in Russian language and literature. In 2006 she graduated from the Faculty of Foreign Languages ​​of the KarSU named after E. Buketov with a degree in English. Ospanova B.R. works in KSTU since 1988. During this time, she passed a large labor school from a Russian language teacher to a head of department. In 2002 she successfully defended her thesis, and in 2005 she received the title of associate professor. Bikesh Revovna is a leading teacher of the department, has extremely extensive experience and practical knowledge, is well acquainted with various management concepts and approaches. Under her leadership, a model program was prepared for the preparation of bachelors in the discipline “Professional Russian Language”, working programs for students of the 1st course of all specialties are developed. 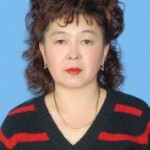 She has completed advanced training courses for teachers in the Republican Institute for Advanced Studies for senior and scientific teachers of the education system of the Republic of Kazakhstan. A highly trained teacher-methodologist, a creative teacher who is trying to find new approaches to learning languages, makes presentations on contemporary problems of linguodidactics and linguistic synergies at international conferences in Singapore, Italy, the Czech Republic, the USA, etc. Her works include more than 60 scientific publications in journals with impact factors included in the international database of Tompson Reuters, Scopus, 1 monograph, she is the author of 5 teaching aids, 4 electronic textbooks, slide lecture course, multimedia presentations in Russian and English. Under her leadership, a research project is carried out on the research topic “Information and Entropy Analysis of the Structure of the Text of a Language”, funded by the MES RK in the field of basic and applied scientific research. Ospanova B.R. He is a professor at the Russian Academy of Natural Sciences, a member of the National Association of Teachers of English, and was awarded the Alfred Nobel Medal for Contribution to the Development of Invention. Constantly develops the strategy of the scientific research activity of the department, takes the necessary measures to coordinate the work of the department with the scientific departments of the university, Russian and foreign educational institutions. Under the leadership of B.R. Ospanova. cooperation agreements were signed with the International Alliance for Innovations, Technologies and Education (USA), with the International Center for Advanced Studies for CIS specialists in Düsseldorf (Interkulturelle Weiterbildungsgesellschaft eV, Germany), with Tomsk State Pedagogical University, Ivanovo State Energy University, thanks to which teachers The departments have the opportunity to exchange experience in the field of scientific research. Ospanova B.R. creates at the department an atmosphere of high responsibility and creative search, cooperation, emotional and moral comfort, interest in the results of work. Her scientific and pedagogical activity makes a great contribution to strengthening the authority of our university.